The E1DL-A has a Manufacturer’s Suggested Retail Price (MSRP) of $240 with retail prices beginning around $170. The E1DL-A arrives in SureFire’s typical retail box which also contains a single 123A lithium primary battery (already installed), owner’s manual, assorted paperwork, and a SureFire decal. Featuring a matte black hard anodized finish, the compact E1DL-A measures 4.25” long and weighs only 3.1 ounces with the included 123A battery. SureFire’s 2-way pocket clip permits the E1DL-A to be carried bezel-up or bezel-down. Body knurling, a flared tailcap and other design elements provide plenty of grip when using the E1DL-A in a variety of holds. The short overall length makes it well suited for use in a cigar hold. The KE1D-A head measures 1.125″ in diameter and has slightly tapered crenelations to reduce the potential for snagging on clothing. The crenelations are not as sharp as those on the earliest E-series Defender bezels. The LED is housed behind a coated tempered window and TIR lens. Crenelations around the tailcap help prevent accidental activation and allow the E1DL-A to tailstand. Holes in the crenelations and the 2-way pocket clip provide lanyard attachment points. The E1DL-A can be locked out, to prevent accidental activation, by loosening the tailcap one-quarter turn. As with the other members of the Defender family, the E1DL uses a click-type switch which provides momentary activation with a partial press and constant-on with a full press and click. The E1DL always defaults to high mode when first turned on with low mode accessed by quickly cycling the light off and back on again. The E1DL-A can be disassembled into its main component parts – head, body and tail – which are compatible with other E-series lights. The battery is loaded from the head and supported by springs at both the head and tailcap. O-rings at the head and tail provide a water tight seal. The following slides compare the SureFire E1D LED Defender beamshots to a variety of other lights to provide a perspective of its output and beam profile. The beamshots can be compared across their full width using the slider and additional images can be accessed by using the navigation buttons in the bottom-right corner of each image. The following beamshots were deliberately underexposed to highlight the center hot spot of each beam. They are not representative of the actual output from each light. Runtime tests were conducted using the SureFire E1D LED Defender with Battery Station 123A lithium primary batteries and K2 Energy LFP123 rechargeable cells. When powered by a 123A primary battery, the E1DL demonstrated an initial drop in output followed by approximately 35 minutes of regulated runtime before beginning a long taper as the battery was depleted. Although not shown on the chart, the E1DL was still producing a very low, but usable, level of light after 2 hours of continuous operation. With a single LFP123 cell, the initial output was maintained for 2 minutes followed by a small step-down in output. The E1DL then remained in regulation for another 24 minutes before output rapidly dropped as the battery was depleted. 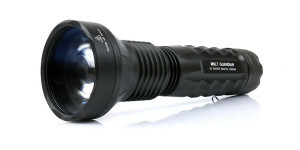 Unlike some previous SureFire lights, the E1DL-A exhibited no problems when powered by a freshly charged LFP123 battery. The E1DL also has temperature regulation which could affect runtimes in certain circumstances. For example, if the light is held stationary in a tight area with no air flow, the built-in circuitry will reduce output to maintain a safe temperature. 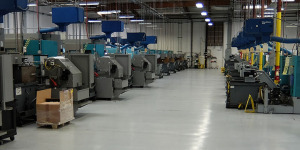 As the output is decreased, battery life is extended resulting in longer run time. With both battery types the E1DL-A produces a very faint buzz, audible by holding the light next to an ear, while operated in high mode. For holster carry SureFire recommends the V91 Nylon Quick-Detach holster. The E1DL fits easily in a bezel-up position and is securely held in place with the long Velcro flap. The V91 is designed for larger lights, such as the E2DL Ultra, so there is some wasted space when using it with the E1DL. The slightly smaller V20, V21 and V25 holsters will work as well. SureFire’s line of 1.125” diffusers and filters – F04-A, F05-A and F06-A – may be used with the E1DL-A. See the SureFire Diffuser and Beam Filters review for more information about these attachments. The concept of the E1DL-A is nothing new as many SureFire owners have been building their own variations of the E1D since the original incandescent E2D Executive Defender was introduced in 2004. As a surprise addition to the SureFire product line in 2014, the E1DL-A is a great way for SureFire to ring in the 10th anniversary of the E-series Defenders. The matte black Type III anodize is smooth and even across the surface of the light although I did notice a pair of very small pinpricks in the finish. All parts fit and thread together well and there have been no issues with the performance of the E1DL-A. The knurled body and flared tailcap provide good grip and the light is just long enough that I don’t have to worry about blocking part of the beam with my hand when held in an overhand grip. The E1DL-A is well suited for pocket carry with its compact size and two-way clip. Bezel-down carry is very secure and the flared tailcap protrudes just far enough to be easily accessible when withdrawing the light. The redesigned bezel crenellations (also found on the E2D LED Defender Ultra) are an improvement over earlier designs and are not nearly as prone to wear out pockets. If pocket carried in the bezel-up position, the E1DL-A is much less secure as much of its length (and weight) is outside the pocket. However, it does carry well in this position when hooked onto a strap or webbing. 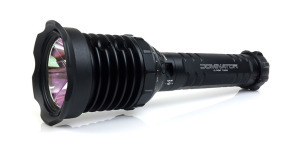 From a performance standpoint, the output level and beam profile of the E1DL make it unique among SureFire’s current flashlight offerings. Although it has slightly less reach than some the Backup series of lights, the much broader center hotspot and brighter spill make it better suited for quickly sweeping or scanning an area. Regulated runtime is respectable for a single 123A primary battery and the ability to use LFP123 rechargeable cells will be an advantage for some. 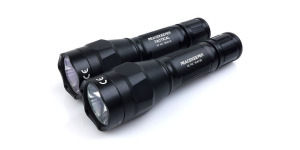 Whether for their performance or the “self-defense enhancements,” the SureFire Defender flashlights have always been among their most popular and the E1DL-A looks ready to continue that tradition. 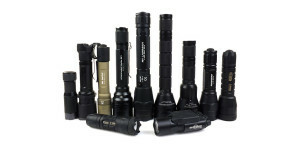 The SureFire E1D LED Defender is designed and manufactured in the USA with materials and components sourced worldwide. Visit the SureFire website for more information about the E1D LED Defender. The 123A batteries used for runtime testing at FlashlightGuide.com are provided by the good folks at Battery Station. Be sure to let us know what you think about it. I think you will like it. The Made in the USA Battery Station CR123s are less expensive than the three brands you referred to but, based upon my testing, I do not consider them to be inferior. I bought a box of the Battery Station cells for the express purpose of testing versus two of the brands you mentioned along with another well respected brand. I found their performance to be pretty much the same, which was not the case with the Battery Station cells that were produced overseas several years ago. At that point I decided to do all of my runtime testing with Battery Station cells so that I could eliminate one variable (battery brand) from my reviews and also reduce the number of different types of batteries I had to keep on hand. 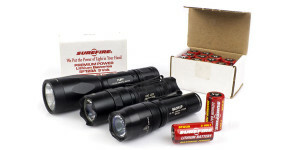 Maintaining a stock of cells from SureFire, Streamlight, Duracell and Battery Station batteries allowed me to test lights with the “proper” battery (the type they were shipped with) but was expensive and difficult to manage. After I decided to go that route, Battery Station agreed to act as the “Battery Sponsor” for FlashlightGuide by providing CR123 cells for runtime testing. I have been testing exclusively with these batteries since then and still have seen no evidence of lesser performance than the other brands. Just to add a thought to the battery discussion, it is widely believed that Panasonic, Surefire, Duracell, Energizer, Rayovac and Battery Station cells are all just re-labeled Panasonic cells. They’re all made in the same plant in Columbus Georgia. As Jim’s testing reveals, (along with others) there doesn’t seem to be a notable difference in performance among all these cells. That is a bummer. I did a little bit of searching and did find one place (http://www.warriorsandwonders.com) that shows them in stock although they are a bit pricey. I don’t know whether US retailers are allowed to ship to Canadian customers or not. Best of luck! Hello, How does the 500 lumen E2D Defender head perform on the 300 lumen E1D Defender single cell shorter body ? Would it work by regulating output to a lower lumen or drain the single battery very quickly at high output? I’m wondering as I have the V1 Vampire which appears to be the same body as the E1D Defender. Would the E2D Ultra head & body be interchangeable with my short single cell Vampire body & head? The E2D LED Defender Ultra head will make some light when powered by a single CR123 but output is considerably less than the E1D head. It would not be regulated at that lower voltage and would likely run for a very long time, providing a continually declining output.